A spin scrubber is claimed to be one of the easiest of appliances that spins on average around a resounding 300 revolutions per minute, therefore ensuring a whirlwind process each time you clean your bathroom! Gaining in popularity due to its ability to cut down cleaning time in one of the most dreaded of rooms to tackle, the best spin scrubbers will get into those more difficult of places to clean, making sure every nook and cranny is targeted. The essential features to look out for when buying such a product as the spin scrubber include the charging facility and time taken, as well as the running time, the speed of the spinner, the selection of brushes offered by each model, and the ease of installation when connecting and extending its brush heads. Homitt sell an electric spin scrubber which they believe not only makes your life easier but also healthier! This is a superior quality spin scrubber which has a cordless design and is powered by a built-in rechargeable battery. This gives it up to 50 minutes of work time and only needs 3.5 hours of charging before you can go again. With a 360-degree high rotating speed, you can work through and wipe away all dirt without any interruptions with this model. 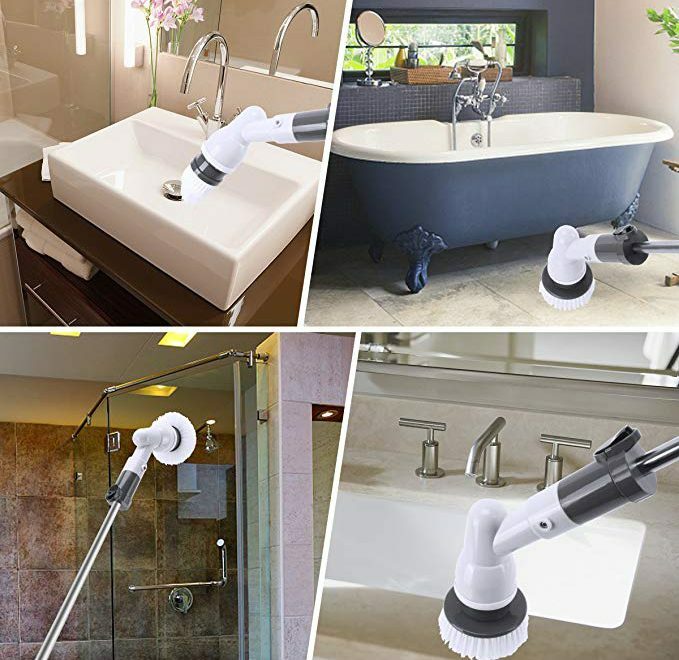 Complete with four replaceable brush heads, these are interchangeable and multi-purpose and allow you to access all areas in the bathroom, from sinks and toilets to walls and floors. You can also purchase replacement heads when you need to. Designed to cut your cleaning time in half, you’ll also save the strain on your back and knees when using the Homitt spin scrubber as it also has an extension arm and adjustable brush handle as standard. You just press the button and begin your cleaning ritual! With a 12-month warranty attached, customers find the Homitt model effortless in use and a great purchase – which is powerful and does a thorough job each time. 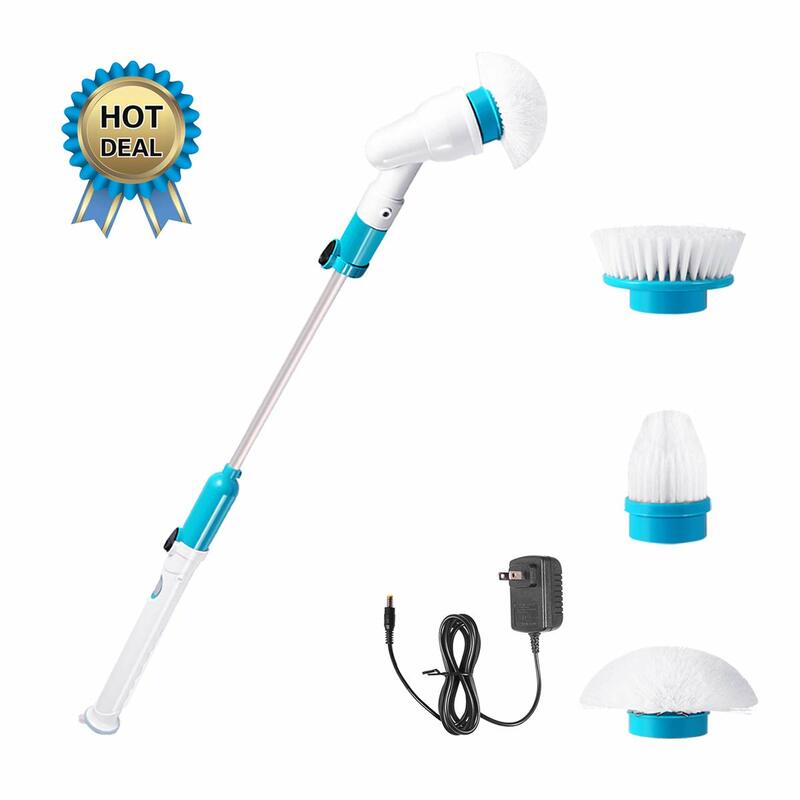 Vandora’s electric spin scrubber is a best-selling model which they believe offers you the ultimate power to get the job done in quicker time, every time! 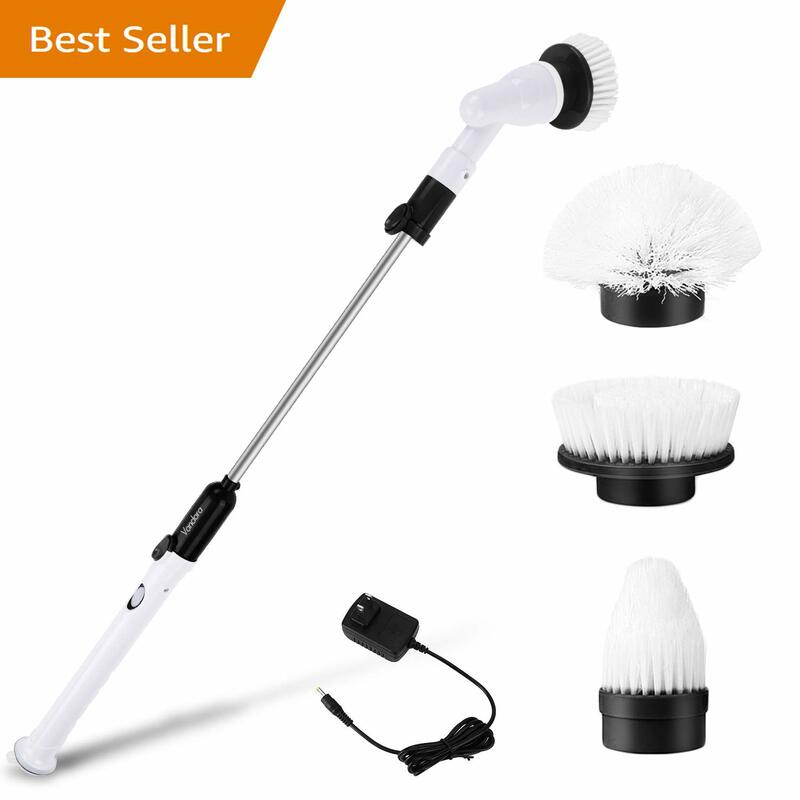 With a three-spin scrubber replaceable brush head, this also comes complete with an extension arm and charger. With an ability to extend up to 21 inches extra, this is a great model for those who struggle to reach certain areas of the bathroom. 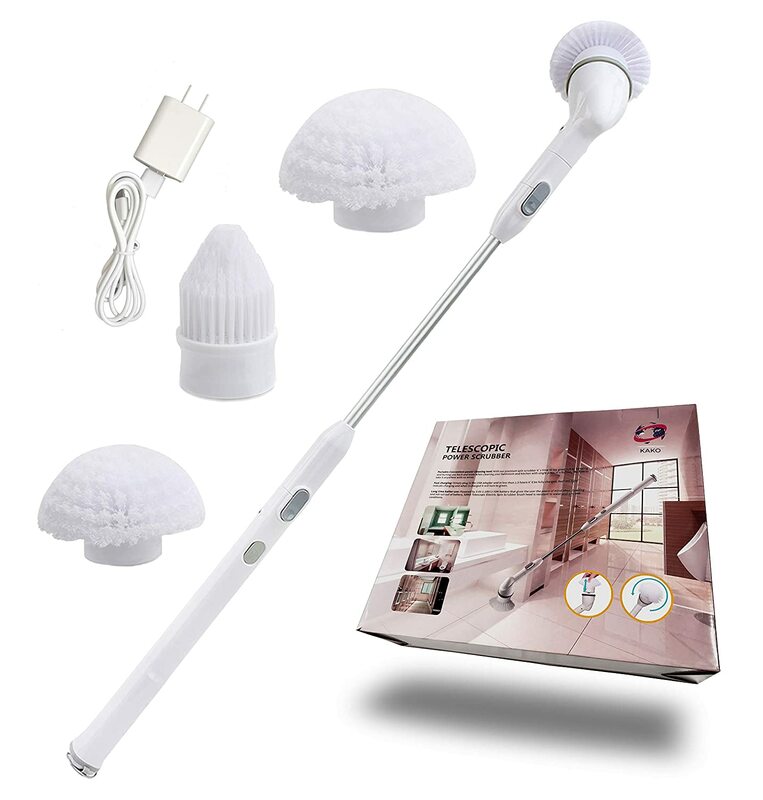 Designed to work through everyday dirt in the bathroom such as mildew, grime, and soap scum, its flexible bristles allow you to get into all cracks and crevices with little effort required. As the Vandora is cordless, you won’t need to worry about any wire trailing behind you and preventing you from accessing certain areas of your bathroom. 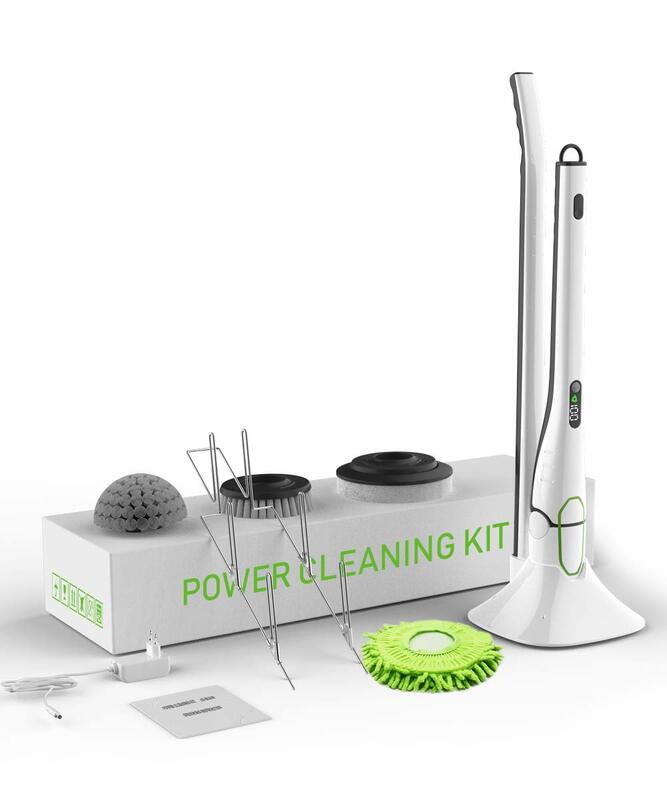 Its rechargeable battery is powered by 3.6 volts and offers plentiful cleaning time between each charge. With a waterproof seal design making this spin scrubber safe to operate under wet conditions, it allows more flexibility than traditional cleaning brushes. With a 12-month warranty as standard, customers of the Vandora Spin Scrubber love the superb results that this product derives every time, all with minimal effort. Good Papa’s Spin Scrubber claims to impress with its remarkably faster charging time and longer operating time than standard spin scrubbers! 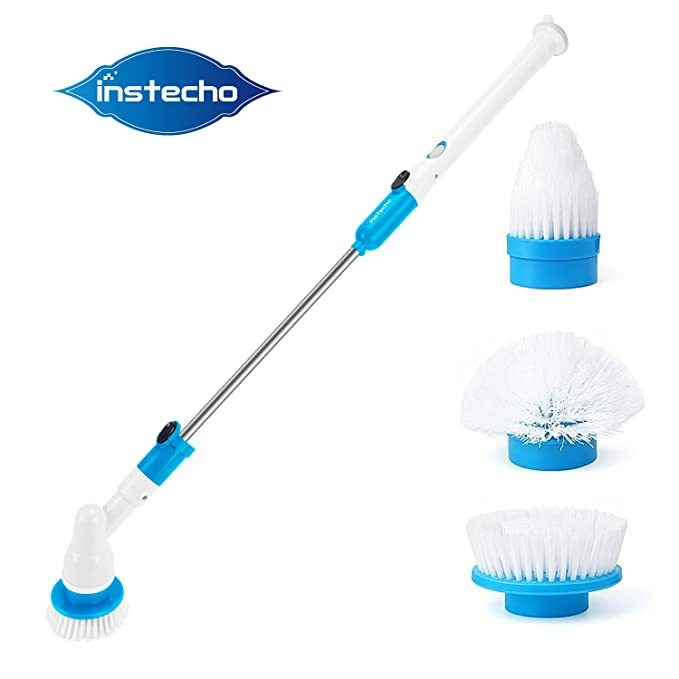 This is a multi-purpose cleaning kit which offers four brush heads which can be used not just for the bathroom, but around the house and on an array of other jobs as well. With a two-speed control mode as well as a real-time power digital display, it’s possible to derive an astounding 1.5 hours of cleaning each time. Therefore you can clean your home from top to bottom in one session! The digital display even keeps you notified of how long you have left until your spinner needs recharging. With an adjustable angle and handle length, this extends to 50.4 inches which is perfect for all areas that are unusually unobtainable as well as great for those who struggle with back pain or arthritis. Entirely safe, this water-resistant model also comes with a practical storage rack. Customs of the Good Papa Spin Scrubber find this to be a perfect model which is extremely powerful and can clean almost anything around the home! WiMiUS believe that their upgraded spin scrubber enables you to achieve a more natural and higher quality of life! This foldable and electric model has a three-section design handle that allows you to adjust and detach without bending down, making it an excellent choice for those suffering from back pain or arthritis. With a battery power that fast charges within 3.5 hours and a working time up to 90 minutes possible, this model has a longer service life. It’s also not restricted by wires meaning you can clean almost anywhere in the home. Its durable brush heads take on a variety of cleaning jobs, all types of stains are instantly removed, and you can even replace them when you need to. With a high-speed pressure bearing design, this model ensures that any stubborn stains are eliminated with the gentlest amount of pressure, for a perfect result every time. Customers of the WiMiUS Spin Scrubber claim this to be a miracle worker which makes cleaning effortless and gets some fantastic results, with the little amount of pressure needed every time. Bert’s Electric Spin Scrubber is a solution which claims to put to rest that often harsh and abrasive cleanser many of us use, introducing a healthier and more natural alternative instead! 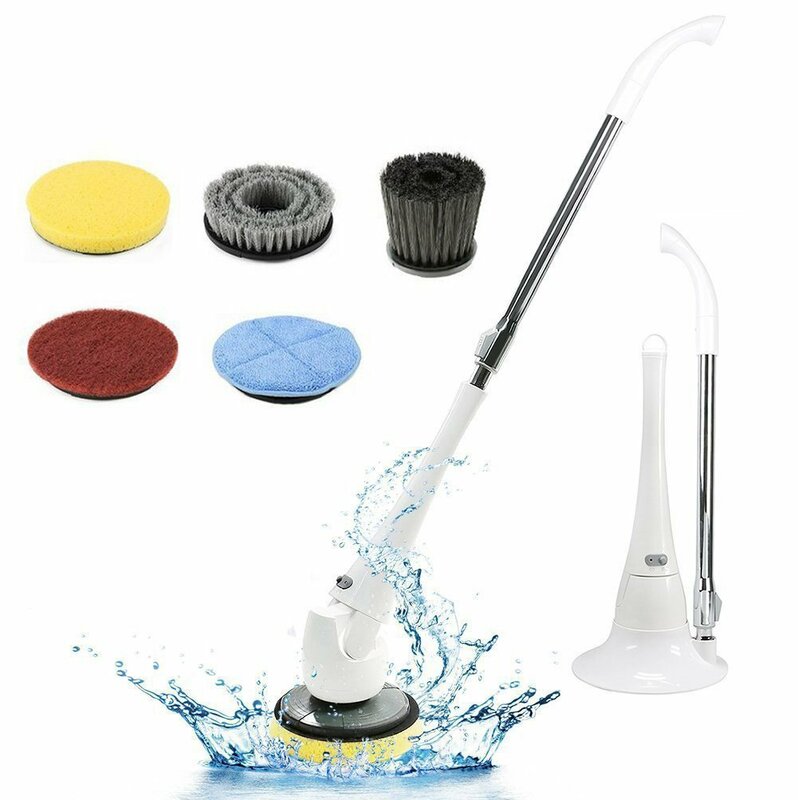 Making it ultra-simple to use and operate, all you need do is connect the extension handle to the spin scrubber and then head for those harder to reach places and clean! Fantastic at performing multiple cleaning tasks, this model works perfectly both in the home and even outside of it. 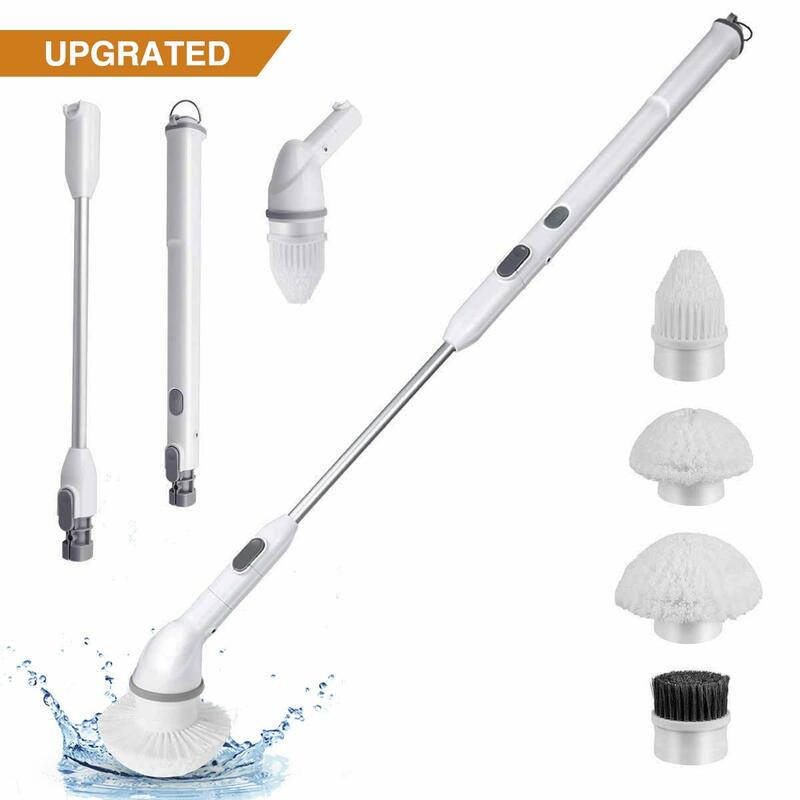 With flexible bristles attached, this is ultra-effective at getting into all cracks and crevices while producing some astounding results, all without chemicals. Its portable corded design, with a 360-degree high rotating speed, ensures that you can cut your cleaning time in half while getting better results every time. The extendable handle is great for those who usually struggle to get into harder to access areas as it offers a 21-inch grip preventing the need to reach up or bend down continually. Customers of the Bert Electric Spin Scrubber find this a straightforward model which is a great little cleaner and easily stored away. 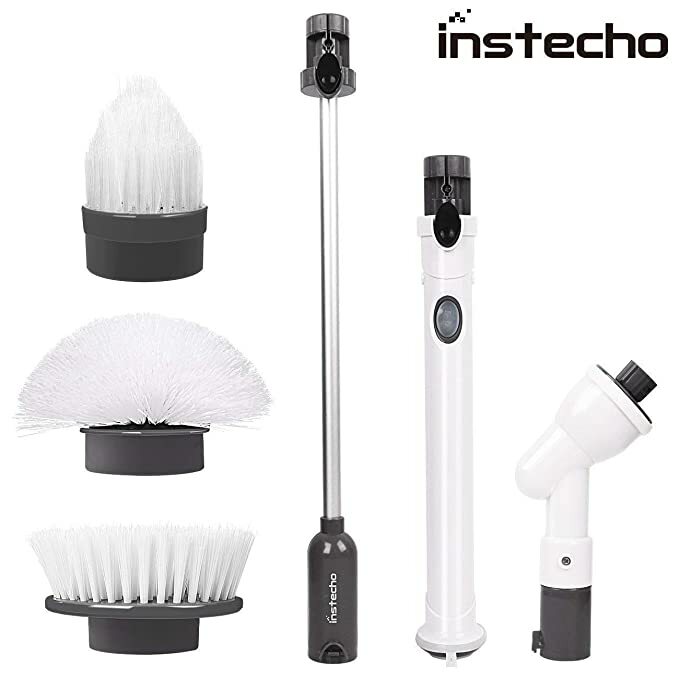 Instecho offer a 360 Electric Spin Scrubber which aims to make your life healthier and more comfortable in return! This is a cordless model which means you can work without fear of being disturbed by a cord trailing behind you. With a 360-degree high speed rotating head, this model can clean even those hard to shift stains with a minimal amount of effort. The three replaceable brush head element can be used indoors or outdoors and there’s an extension arm for added maneuverability, making light work of those harder to reach places. With a waterproof seal design, it’s entirely safe to use and operate under wet conditions, and you can replace heads whenever necessary. Using the power from a 3.6-volt rechargeable battery, the charging cord is also included here, meaning you can plug, charge, and clean without further hassle every time. With a one-year warranty period as standard, this is a simpler to operate but powerful cleaning tool designed for ultra-convenience. Customers of the Instecho Spin Scrubber find this model exceeds their expectations and provides a gentler cleaning experience overall, working well in those harder to clean areas. Kako provide an electric spin scrubber which they believe is the most trusted model which cleans better and saves time compared to standard spin scrubbers on the market! Used and trusted by those professional of cleaners, this a new design which offers an extended rod with your purchase, therefore, allowing you to access with ease those harder to reach areas of the home. Designed to save your knees and back from unnecessary strain, this is powerful but lightweight, ensuring cleaning is a lot easier with its longer extension. With a replaceable three brush head, multi-cleaning is possible here through a big brush, a side brush,and a pointed small brush. All you need to do is turn this on and go and within minutes you’ll see it getting to work effectively, even in those areas that encourage the more stubborn of stains. With a higher torque rating than most standard spin scrubbers, this is a powerfully higher concentrated pressured model, getting the job done quicker. Customers of the Kako Spin Scrubber find this to be a more comfortable and accessible design which requires a minimal amount of pressure when using but leads to some fantastic cleaning results. 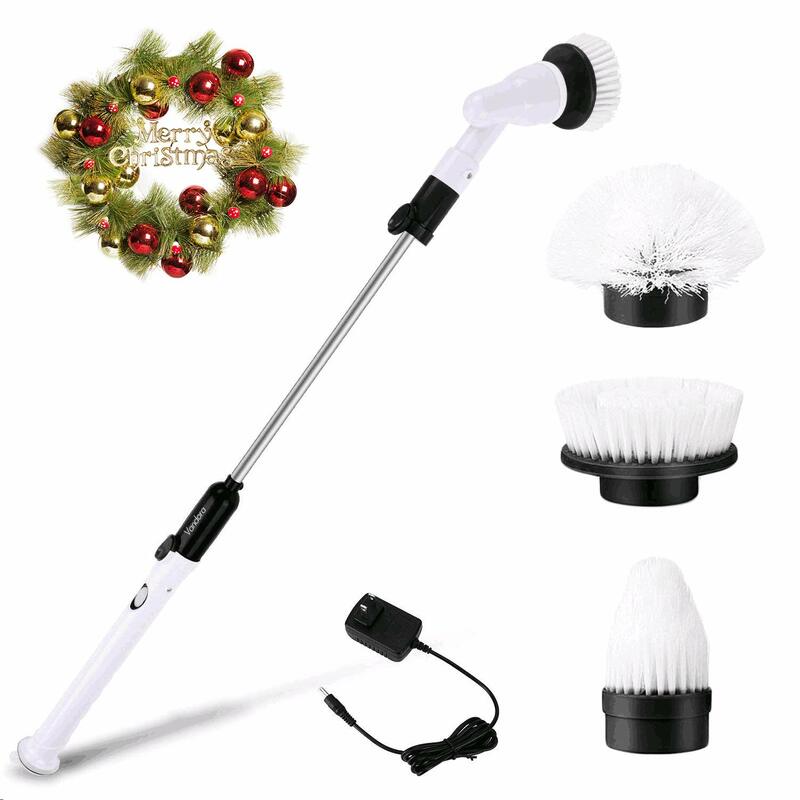 Evertop’s Electric Spin Scrubber is a powerful scrubber designed to offer a smarter cleaning solution allowing you to reduce your cleaning time drastically, so you can get on enjoying your life as a result! This is a five in one extremely functional model which offers a fully comprehensive cleaning routine from brushing and scouring not just the bathroom areas, but many other places in the home as well. With an adjustable angle movement, this model can be constructed to sit at an angle that is the most accessible and comfortable for your cleaning needs. Therefore, it’s a great model for those who suffer from back pain or arthritis. Water resistant and safe, it’s resistant to splashing water and can be used in wet conditions. Its also mildew and bacteria resistant for assured continued and improved health when using. With a fantastic 120 minutes running time, you get a reasonable two hours of substantial cleaning between charges! Using 220 rpm, you can have your entire house cleaned in one session and still have time left over before the battery needs re-charging! Customers of the Evertop Spin Scrubber believe this handles exceptionally well and is a powerful cleaning device all-round. Crislan sells what they believe is a powerful but practical cleaning helper, which is guaranteed to save you time and indeed effort while completing the housework. This lightweight spin scrubber is a cordless model which is perfect for all bathrooms, floors and walls. Deriving its power from its 3.65V battery, this model offers up to 50 minutes of real operating time and will charge fully in just 3.5 hours. With a 360-degree high rotating speed, it works efficiently and speedily through the toughest of cleaning jobs and all without interruption. A more comfortable design, this is a sturdy model but easy to grip and makes all jobs easier as it requires no lifting or bending. Designed to get into all harder to reach areas, there is a three replaceable brush head with interchangeable brushes. This allows a multi-purpose job each time and eliminates mildew, grime,and soap scum instantly. With a 12-month warranty as standard, customers of the Crislan Spin Scrubber rate the battery life as excellent and its performance spot on each time. Meter.llc’s Spin Scrubber is claimed to be a high-speed charger and provides much longer using time as standard! 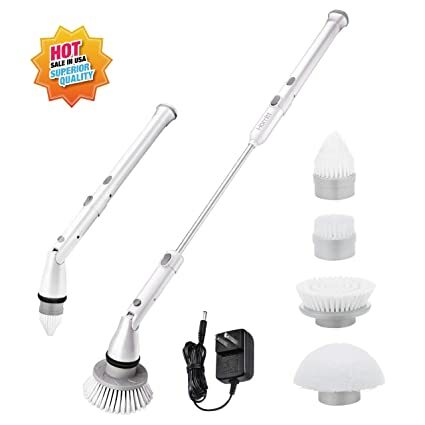 Provided with a 3.6-volt battery, there is ample time to work throughout the home getting all cleaning jobs done in half the time with this model. With a three in one design, this is a complete cleaning set which offers three different brush head types and a USB cable as standard. These brush heads are all differently sized to ensure all areas of the home are reached with ease. With a spin scrubber extension allowing an additional 3.6 feet, cleaning is made effortless with this model. Lightweight and easy to use, all it requires is one push of the button to start and the movements are quiet and without vibrations throughout for continued ease of use. With an ability to operate under wet conditions, this also comes with a Spin Scrubber free warranty and 24/7 online customer support. Customers of the Meter.llc Spin Scrubber find this a thoroughly convenient model which makes cleaning effortless all round. The above spin scrubbers are some of the best the market has to offer. While they somewhat almost all look the same at first glance, some are no doubt better, more practical and more powerful than others. As mentioned earlier at the beginning of the article, factors to mostly keep in mind while shopping for the best spin scrubber for your home needs are, the speed and how powerful the scrubber is, the run time before it needs recharging and the selection of cleaning brushes.